ENGINEERING. PRACTICE. POLICY. 39 June/July 2018 unmanned systems inside Gene Robinson and his team from Drone Pilot, Inc., dealt with impassible roads and other obstacles as they fl ew UAS to help with the response eff orts after Hurricane Harvey. 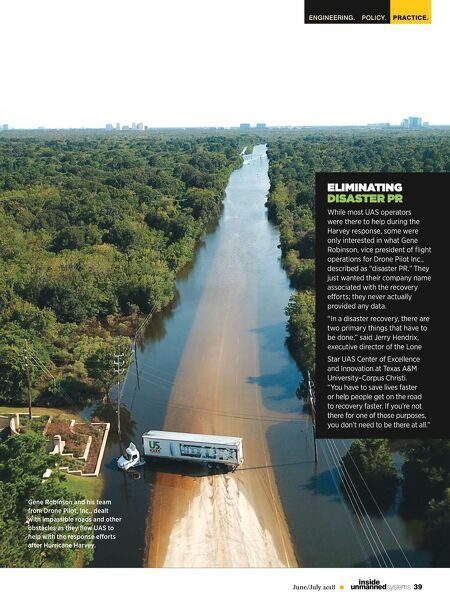 ELIMINATING DISASTER PR While most UAS operators were there to help during the Harvey response, some were only interested in what Gene Robinson, vice president of fl ight operations for Drone Pilot Inc., described as "disaster PR." They just wanted their company name associated with the recovery eff orts; they never actually provided any data. 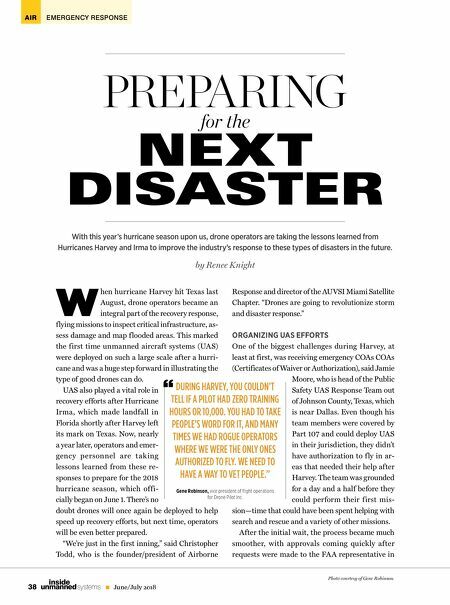 "In a disaster recovery, there are two primary things that have to be done," said Jerry Hendrix, executive director of the Lone Star UAS Center of Excellence and Innovation at Texas A&M University–Corpus Christi. "You have to save lives faster or help people get on the road to recovery faster. If you're not there for one of those purposes, you don't need to be there at all."